My sister in law, Deb, was married on Saturday. She married a wonderful man, Steve, and the two of them are beginning a whole new life together. Myself and the rest of our family at large were honored to bear witness to this union. And of course, you know what else a wedding is, right? A chance to shop, of course! And a general opportunity for two people who have no professional requirement to ever get dressed up, to, well, get dressed up. I think we shined up pretty darned well. But not only us, the kids too! Even if some of them were mildly reluctant to take any photos seriously. Okay, fine. With church light this good, just point the dang camera at me then. Here, I'm playing the coy "I'll just press my nose into your cheek" girl, while simultaneously telling Dan how happy I am to have lost that extra chin. And while the nose thing was working so well, I did it here too, resulting in one of my favorite photos of the day. Another favorite? Deb's maid of honor, my sister-in-law Joy. Gorgeous, I tell ya. That church had such magic lighting, it's as if Jesus himself was holding the reflectors. Seriously. It was a magical and insanely fun night. We danced our little tushkas off at the reception. My favorite moment of the night? Dancing with Aidan, and all my nieces, and sisters-in-law, singing our hearts out to the Grease medley. That, and when they played Brickhouse and Low. I'll tell you this much: I'm a hella lucky girl to have hooked up with all of these people. I love this family. I also have realized that I love weddings. So, my dear adult nephews, if you're out there, you need to get a move on and give us 40-something couples and their families more reasons to dress up and kick it old school. 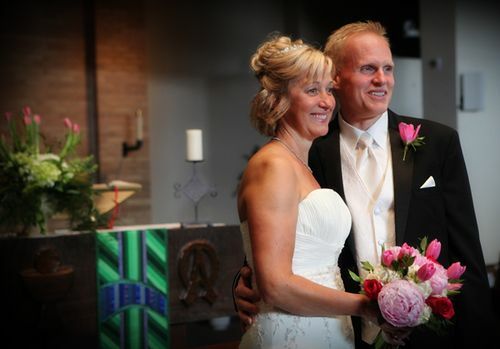 Deb and Steve, thanks for sharing your special day. We wish you a lifetime of happiness. And let me tell you that your daughter is soooooooo pretty! I love all the pictures, it was great lighting!!! All the outfits your family wore look great and made all of you look GREAT!! You look gorgeous Cathy! Black definitely suits you! I, too, love weddings. Mostly because of the shopping and dancing. 😉 You look beautiful, Cathy. Those pictures look amazing and just truly glow 🙂 Love it! That necklace truly was made for you, CZ! You looked fantastic, all of you. I was at my cousin’s wedding on Saturday, and wow, it’s the best, isn’t it, celebrating two persons who love each other more than anything. You all look so fantastic!!! What beautiful pictures. The perfect ages to have these timeless pictures of all of you. So glad you got all organized and someone got married so you could do this. You guys look awesome, all of ya! Glad you had a great time! Aw Cathy. You (and your family) clean up so nicely. I too am a lover of weddings. Our wave of summers full of weddings has given way to babies poppin’ left and right. Guess I’ll have to wait until my young cousins start getting hitched. On a fashion note, I’d like to say that I once owned a pair of Onex sandals in silver and wore them into the ground. LOVE the suede insoles and the slightly wedged heel. So comfy and cool. Good purchase! BEAUTIFUL PICTURES, BEAUTIFUL FAMILY AND ESPECIALLY BEAUTIFUL YOU. YOU LOOK MARVELOUS!!!!!! you guys are the most stylish family ever. period. Wow. Beautiful pics. I love a good reason to get all dressed up! CZ Necklace – too funny! Definitely cosmic forces guiding you that day. Gotta love Ann Taylor. Great photos – thanks to the lighting and the subjects! We have loved the weddings we have attended in recent years. At our niece Carrie’s wedding to Al, I remember all of the contemporaries of the bride and groom dancing to “Low”. But when “Brick House” came on everyone was on the dance floor! P.S. Of course for coming down the aisle you can’t beat Jill and Kevin Heinz from St. Paul ( http://www.jkweddingdance.com/ )! The necklace is very similar to the one worn by Anna Wintour in September Release….but I like your pick better – and the name – how cool is that? Love that I can always count on your posts for a good laugh in the mornings! Cathy…..that necklace was made for you, defintely divine intervention!!! Your family looks simply smashing and yay for the no double chin!! Aren’t wedding fun!!! Great pictures! You have such a good looking family! I’d like a few more weddings too! Denise, yes! Those soles with the suede. SO comfy. I really can’t do heels of any kind, and these were perfect! Cathy – you look great. Thanks for sharing the photos. And the necklace was made just for you. Perfect – everything – perfect! Wow, your whole family looks gorgeous! I especially love the pic of you and your daughter together. i hope you took a thousand photos in that magical light! they are awesome. and we would have had fun at our niece and then our nephews wedding’s last fall if it had not been for our grouchy 10 year old who got tired and wanted to go home. why not hire a sitter you ask? these were her cousins. couldn’t actually leave her at home. she is crying in the family photo. i could have danced all night with the young folks. bahhh. Beautiful pictures! I especially like the first one of you and Dan. The expression on his face is so mischievous! Almost giddy. Such a lovely picture. You are ALL so gorgeous. Dan’s suit is really really cool – love the pattern with the tie. The coy nose to the side routine is one of my favorites too. Gorgeous photos!! You all look wonderful and I LOVE Aidan’s dress too. My favorite photo was the one of you two. What a beautiful family and amazing photos. Thank you for sharing them with all of us! It looks like it was a magical day. Your look turned out fabulously! Congrats to your SIL! Love seeing your photos with your family & all the dress-up garb! You all look marvelous!! We both work from home, in a truly casual town (dressing up here means a sweater with khakis…). With a wedding looming in our future in a couple of weeks, I’m taking note of your amazing, beautiful garment choices! Tried on some black dresses over the weekend, with my 21 yr. old admonishing me about how we’re going to a wedding not funeral… but I LOVE black clothes! I too can not & choose not to wear heels, so am also noting your terrific shoes/sandals – and hair cut… Might have to retire my ancient black Birkenstock strappy sandals that have sewn together straps from a mishap with a lab puppy… The scary thing about this wedding? This is the first friend of my daughters to get married… the snowball has begun to roll! Yep, you all shine beautifully – individually and together. Love Dan’s expression! Great photos, you all look so good and it looks like you had a lot of fun, thanks for sharing! Thank you for sharing…you look like you stepped out of an Ann Taylor catalog…and your family is perfect! you look FABULOUS! was everyone gushing about how much weight you’ve lost in the past few months? Dan really rocks that suit! Thank you for sharing the photos. You two look awesome together. Stunning – you are just georgeous. Family pictures like these are also so very precious. Look at those COLLARBONES in all those fantastic shots! Way to go CZ! You look great! Mrs. Z, you have a beautiful family! And you look fab, Girl!!! Jane, me and Aidan, those teeth? Cost an awful lot of money, especially mine. You have no idea! Great photo of you and your daughter!!!!! By the way you look fabulous!!!!!! love, love, love the pictures Cathy!! Thanks for sharing, too often family get togethers are funerals so I always love to see weddings! Oh my that picture of you and Aiden is fabulous! That necklace is gorgeous – you really add a sparkle to it. Absolutely beautiful pictures, especially the one with Aidan and you. Your family just gets more beautiful and cooler looking with every passing year. Congrats! 1. LOVE the dressing up thing. My husband and I also have jobs that mean dressing up never happens. He bought an interview suit in 1991 and said to the saleslady, “Make it a classic, because the next time I wear it after this will be in my CASKET.” Ahem.